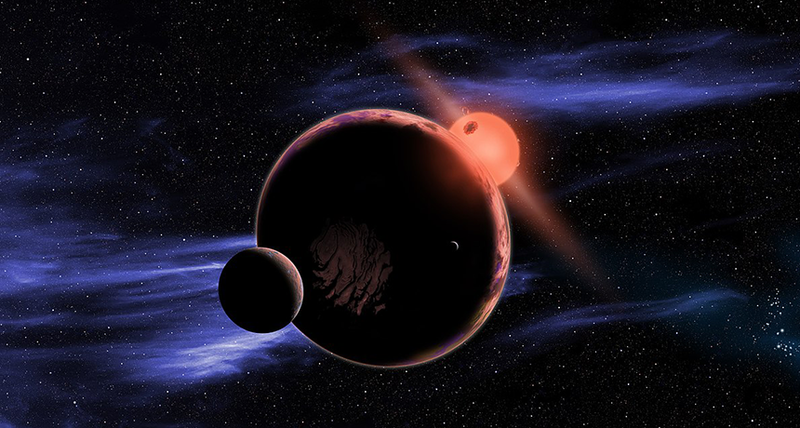 Red dwarfs, such as the one pictured here glowing red in the background, are small. But that doesn’t mean that couldn’t have a planet or two, such as the planet and moon crossing in front. A red dwarf is a type of star. Red dwarfs are between 0.075 and 0.5 of a single solar mass. That means even at their biggest, they’re only half the size of our sun. Red dwarfs are also cooler than the sun. They only reach about 3,700° Celsius (6,700° Fahrenheit), compared with the 5,500 °C (9,900°F) of our sun. Most of the stars in the Milky Way are red dwarfs. You’d never know by looking up at the sky, though. Red dwarfs are very hard to see. That’s because they are so cool. A star’s temperature determines how bright the star is and what color we perceive when we look at it. Yellow dwarf stars like our sun are hotter and give off more energy. We perceive these stars as yellow or white. The cooler temperatures of red dwarf stars means that they give off less energy, and their light is reddish. That red color is much harder to see. That means they’ll escape any stargazing that you try without a telescope. But just because they’re small and cold doesn’t mean these stars are lonely. Red dwarfs can have planets orbiting around them. For example, scientists know that our nearest stellar neighbor, Proxima Centauri, is a red dwarf star with at least one planet.